5 must-try restaurants in Ontario&apos;s Southwest. The Food Network is not a channel I like to watch too often; there’s way too much food that I won’t be able to cook because I lack any type of culinary skill. However, there is one show on the channel I don’t miss, You Gotta Eat Here; there’s no cooking necessary, it’s all about eating. The show follows its host as he travels across the country in search for Canada’s best, over-the-top comfort foods and signature dishes. It comes as no surprise, the show has been to quite a few spots right here in Ontario’s Southwest. It even exposed some hidden gems that I didn’t know were basically right in my backyard so to speak. In honour of the new season of the show kicking off recently, I thought I’d share my Top 5 favourite spots that I have visited from the show. First up is the Argyle Street Grill. Located in Caledonia, this place is a local favourite and is well known for their ribs and wings. 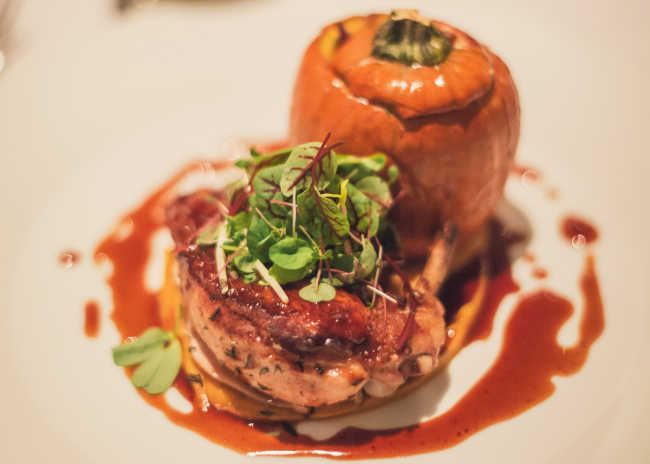 The menu is full of foods that highlight the restaurant’s commitment to local farmers and food producers. I went in to try the Braised Beef Short Ribs that were highlighted in the show, and I must say they did not disappoint. The food was every bit as good as it looked on the screen, if not more. Plus, the small town charm is hard to beat. Next up is Motor Burger in Windsor. 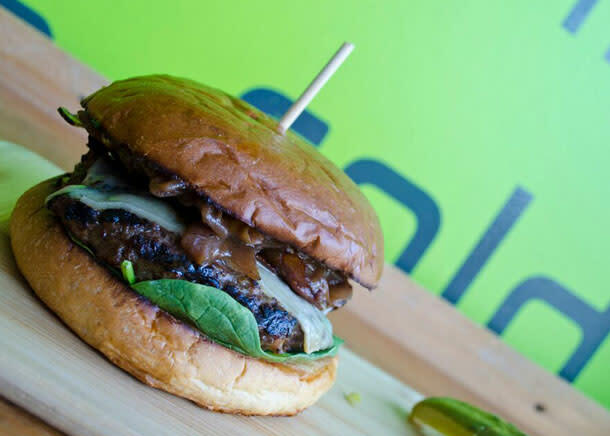 As the name would imply, Motor Burger is home to some of the best burgers…anywhere; and with names like Lamb-orghini, Fire Bird, and Smart Veg-Engine, it’s hard not to get excited about them. One of the burgers on the menu, the Deux Chevaux, was actually named by Reader’s Digest as one of the Best Burgers in Canada. My personal favourite would have to be the El Camino. Made with chorizo sausage, avocado-chipotle aioli, and lime spiked tomato salsa, it is the most flavourful burger I have ever eaten. As an added bonus, the restaurant offers a selection of their very own hand crafted brews. Now we roll into London and the Early Bird. I did a part of my post-secondary studies in London so I’ve spent plenty of time at the local eateries but somehow I managed to miss the Early Bird. I don’t know how as it’s located just steps from Budweiser Gardens, but I’m glad the show featured it as it’s become one of my favourite places to eat. The menu is full of unique recipes, from the Fat Elvis and Ginger Beer Battered Tofu to the featured Turducken Style Club sandwich. A word of advice, if you’re going to try the Turducken, take a friend with you, there is more than enough to feed two people in this unbelievable sandwich. Port Dover’s the Crepe House is the next stop on our list of You Gotta Eat Here locations. Just a short walk from Erie beach and the pier, the Crepe House grew from a mobile street cart to a fantastic establishment known for its home-made dishes using as many local ingredients as possible. You can choose from traditional crepes on the menu but it’s the unique creations such as Turkey Dinner, Powell Park, and the Cannelloni that really put this place on the map and the small screen. 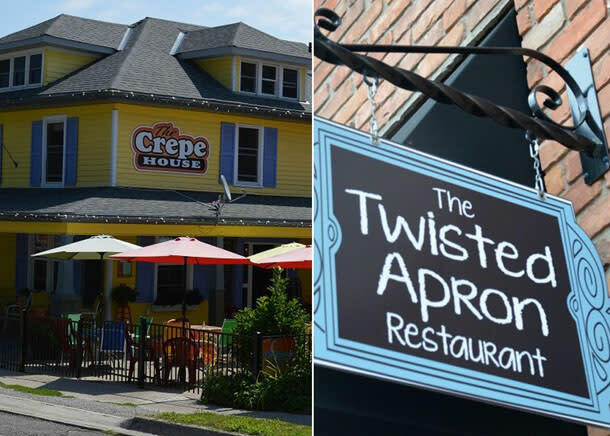 Last on the list is the Twisted Apron, a quaint little restaurant in Windsor that provides home cooking with a twist. You’ll find a nice tasty twist to a number of your favourite foods, like the Beef Stroganoff Poutine, Eggplant parmesan sliders, and my favourite, the Smoked Salmon Waffle Benny; a quinoa dill waffle with smoked salmon, red onions, fried capers, poached eggs, and Hollandaise sauce. To top it off, their drinks list is full of local brews and wines from right here in our region. I don’t know about you, but just writing all this has made me quite hungry. It was difficult to pick a Top 5; there are many more hidden gems from the show that I could have included. And after the full new season has aired, my Top 5 may change as the show travels to even more restaurants in Ontario’s Southwest over the coming weeks. I’ll be more than happy to adjust my You Gotta Eat Here list after some more hands-on research.